We had a snow day! It was so fun seeing my boys really enjoying playing in the snow for the first time. Last year they were just too little and hated it. The next day we still had a lot of snow... but also wind chills around -6. I just couldn't take them out in that kind of cold, but they still really wanted to play in the snow. So what did we do? 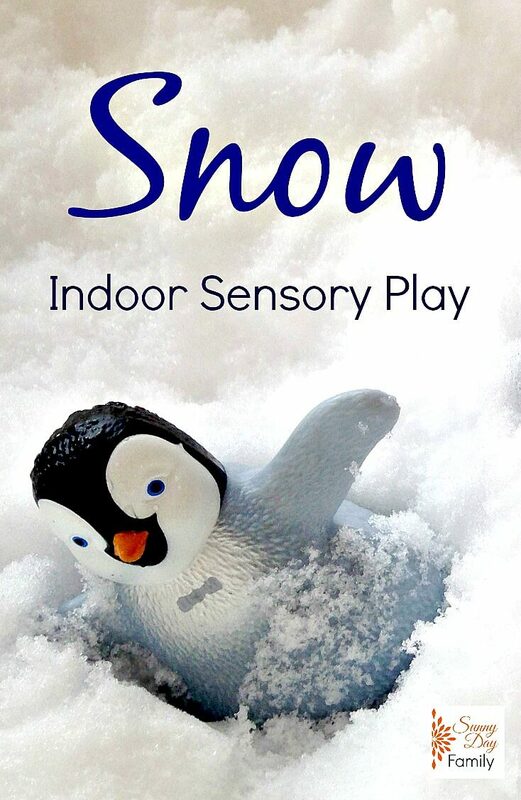 Brought the snow inside, of course! 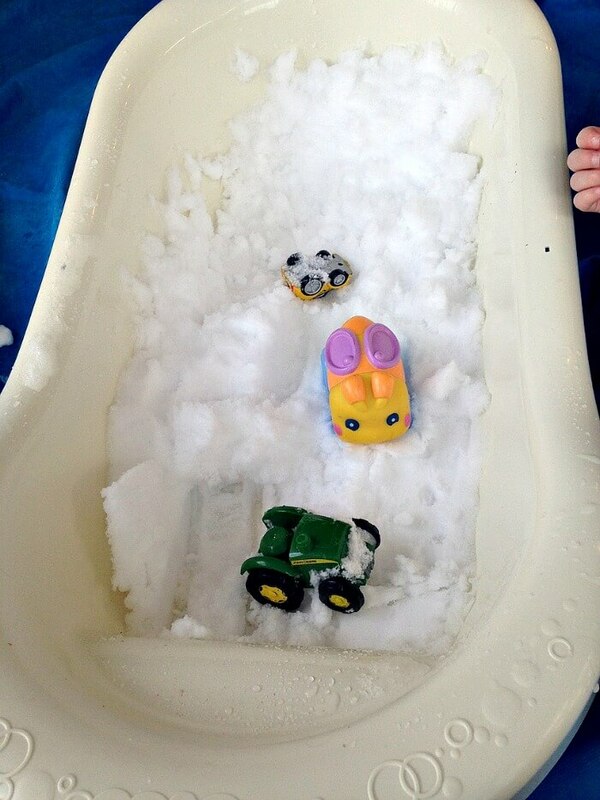 I set up our old baby bathtub - it's my favorite sensory bin. It worked especially well for the snow because I could just drain it when we were done. I braved the cold and scooped some snow from our patio into the tub. Then I laid down a big water-repellant sheet and put the tub on top. Time to play! I gave the boys some scoops and containers from the kitchen. I didn't know if they would want to touch the snow with their hands but they dove right in! My truck lover grabbed several of his cars and practiced some snow driving. While my animal lover decided to let his favorites do some playing in the snow. 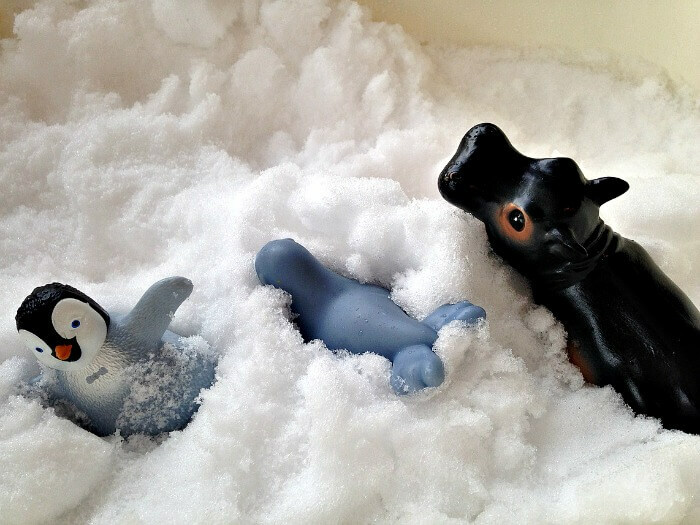 His hippo braved the cold to join the penguin and the seal for some winter fun. This activity was so much fun - we did it 2 days in a row! As long as you've got some snow, a few scoops and bowls, and some water resistant toys (these arctic animals are perfect!) you are all set. 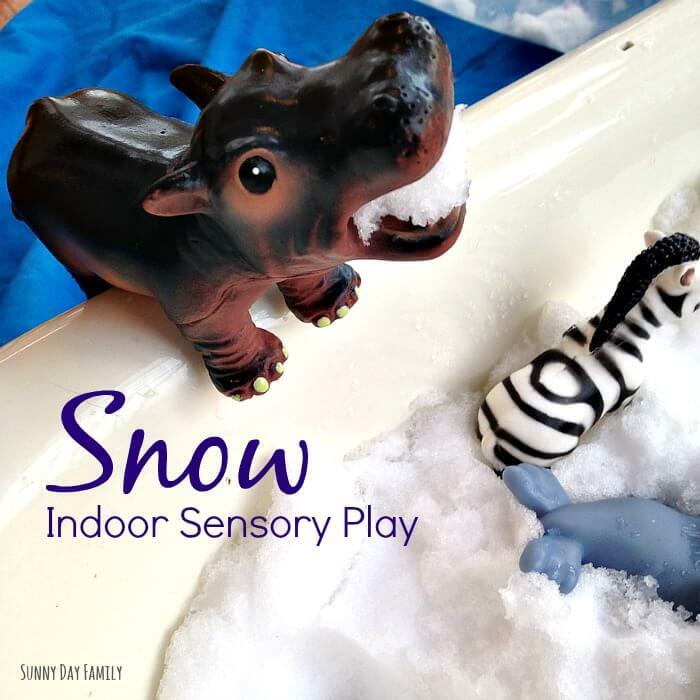 It was such a great way for my boys to experience snow play when the temperatures made it impossible to be outside for long. Next time you've got a snow day give it a try! Looking for some snow inspired crafts? Try my Coffee Cup Snowman and Build a Snowman Busy Bag too! 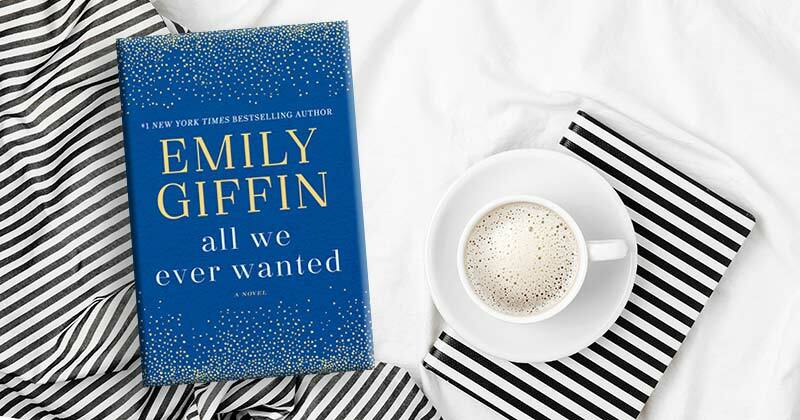 How about a book for a snowy day? I've not tried bringing the snow indoors yet but since we've got PLENTY it's on my list! Like that you kept the tub! We have an outdoor water table that we sometimes use indoors except this year I forgot to bring it in for the winter months and now it's covered under way too much snow! Oh, what a great idea! We've done bowls and buckets, but I NEVER would have thought of the baby bath! We got a couple inches of snow overnight and I'm going to do this today since it's WAY too cold to go outside. Thanks for the idea! 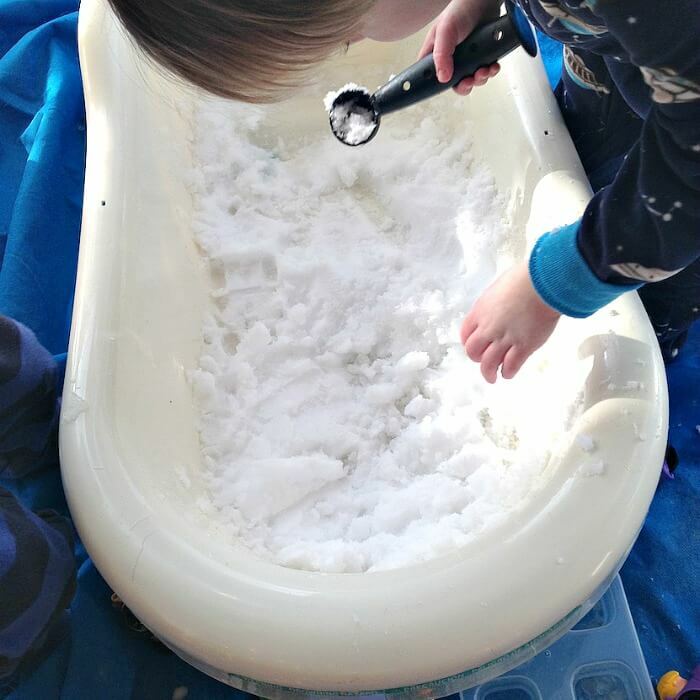 I've had my kiddos play with painting snow before, but haven't tried this - yet! Fun idea!